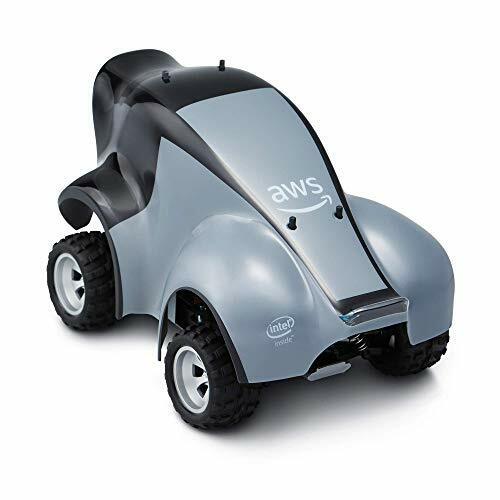 You’re looking at Amazon’s DeepRacer, advertised as “the fastest way to get rolling with machine learning, literally.” DeepRacer is an interesting integration of a 1/8 scale electric race car chassis and an Intel dual-core Atom processor running Ubuntu. It appears that DeepRacer is based on Amazon’s DeepLens, an AI training system Amazon released in 2017 (see “Exploring AWS DeepLens” for interesting details). DeepLens appears to be using an Intel SoC, a dual-core Atom E3930 with an Intel HD Graphics 500 GPU. The GPU has 12 execution units capable of running 7 threads each (SIMD architecture), the equivalent of 84 cores. The SoC with this GPU is capable of doing interesting image processing on an “edge” device, with the Atom cores doing the basic integration and control of the entire device. And all of this tied back into Amazons Web Services (AWS) for further machine-based inference. It is thus a very interesting device, and all for the paltry sum of $250. Great tech bundle if you can get one. DeepRacer was announced towards the end of December 2018, and I placed my order for a unit on 1 January 2019 after it became available again (it’s now no longer available, again). Expected release date was supposedly 6 March, or a mere three days from the date of this post. Yesterday I got an order update email from Amazon telling me that the delivery date for my unit was being pushed back six weeks to 19 April at the earliest, with the option to cancel the order if I so wished. At this point I’m not sure what to do. The DeepLens kit is $250 just by itself and is also available on Amazon. If I were to build my own DeepRacer clone system using a DeepLens to start with, the cost alone would easily be double the cost of a real DeepRacer. A second alternative is to go full maker and build everything from scratch, substituting cheaper hardware all around, especially the processor. That might allow me to get something approaching DeepRacer in functionality, but hacking the software to perform the same rough functionality isn’t something I want to take on. I’ve followed that lone gunslinger penny-wise-and-pound-foolish type of engineering path in the past because I had no other options, but this time around I really don’t want to go there. The graphics inference engine that runs locally is coded around the on-chip HD Graphics 500 GPU, which isn’t something to look askance at. It might not be an nVidia or Apple class GPU, but it’s no slouch either. I would be sorely pressed to find an equivalent alternative on a SoC, find it on a cost-effective SBC, and find software to bootstrap on this so-called mythical SBC if the SBC even exists. 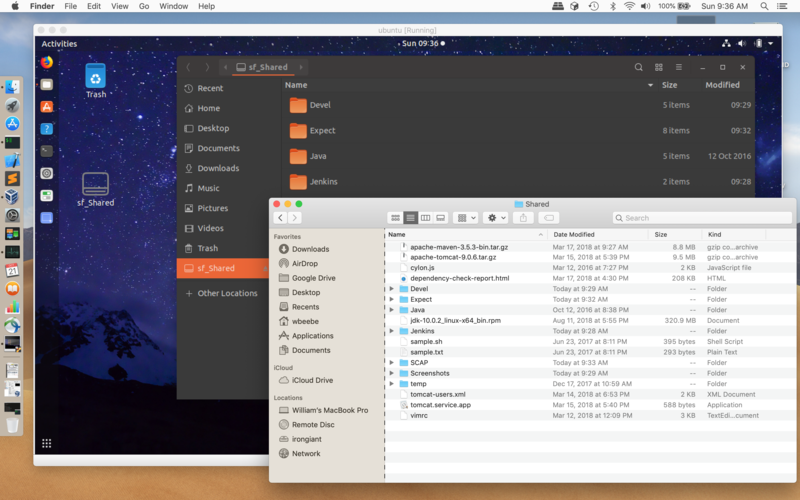 Viewing the same folder and its contents under Ubuntu 18.10 and macOS 10.14. Last post I described installing Ubuntu 18.10 as a virtual machine on my Macbook Pro under macOS Mojave using Oracle VirtualBox. This post I want to describe some quick tweaks to set up and share a folder on the macOS file system with the virtual machine. When installing VirtualBox for the first time (and every time thereafter) make sure to install the Guest Additions. The Guest Additions allow tighter, more efficient integration of the guest VM with the host OS. It also allows for additional functions, such as shared folders between the host OS and the guest VM. On the macOS host side, create a folder you want to share with the VM. In my case I created ~/Shared to share. It will have no special permissions on the macOS side, just normal default read and write permissions. When initially creating the Ubuntu VM, in the VirtualBox section called Shared Folders, find and use the shared folder under macOS. Make sure it’s enabled read/write and automount. After installation and first boot, install the Guest Additions in the VM. First make sure the Ubuntu VM has the necessary build tools installed. If you performed a minimal installation (which I highly recommend) you can install those with ‘sudo apt install build-essential’. With the VirtualBox VM in the foreground, on the top menu (not Ubuntu’s menu), select Devices | Insert Guest Additions CD Image… A dialog will appear in the Ubuntu VM to auto run a script on the image it’s trying to mount. Simple select Cancel and allow the Guest Additions to mount on Ubuntu. Open a terminal and cd to /media/ubuntu/VBox_GAs_5.2.20. The path format is /media/[account]/[VBox_GAs_[version], so this path will be dependent on the account you created in the VM and the version of VirtualBox you currently have running. In my case I always create an account that’s the name of the distribution (ubuntu) and I’m currently using VirtualBox version 5.2.20 for this example. Inside that folder execute ‘sudo ./VBoxLinuxAdditions.run’. This will begin the process of building and installing all the necessary kernel modules for various features and optimizations. If you installed the essential build tools (or you installed everything up front) then the script will successfully execute, everything will build, and you’ll see a folder on your desktop that matches your shared folder name, with a ‘sf_’ prefix. You’re not done yet. You need permissions on the Ubuntu/Linux side to access the shared folder. The shared folder is under /media/sf_[shared_folder_name]. it will have a group ownership of vboxsf (VirtualBox shared folder). You can sudo into it (sudo cd …) or you can add your account to the vboxsf group and avoid the annoyance. The fastest way to add your account to the group is to edit /etc/group. Open up /etc/group (sudo vi /etc/group) and find the vboxsf entry, at the very end of the file. Append your account name to the end (i.e. vboxsf:x:997:ubuntu in my case, where I added ‘ubuntu’ after the ‘:’). Save. Log out and log back in. At this point you can either cd into the folder or you can open up the link on your desktop. Why do this? After all, VirtualBox supports drag-and-drop onto the VM’s desktop. The issue is duplication of files. If I want to work on the same set of files on both macOS as well as Ubuntu (think of develop and cross-testing) then I don’t want a lot of duplication (or any, actually) and I don’t want to loose track of which is more current, especially during source code development. And if I have more than one VM on my host system (and I have a half dozen at the moment) sharing a common folder is a major requirement.